Have you ever wanted to try tapestry crochet while crocheting in the round? Here’s a neat hot pad pattern to try out! Worked in 2 colors, this pattern creates a unique design. You’ll need a basic knowledge of how to change colors in crochet and how to carry the yarn in your work. 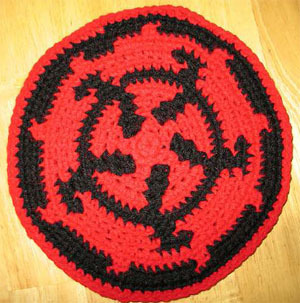 For an extra thick and sturdy hot pad, make 2 of the circles and crochet them together when you’re done. Gauge: Not too important for this pattern. Note: to carry the yarn, hold color B along top loops of round 1 and sc over it with color A. Throughout the pattern be sure to carry the strand of yarn you are not crocheting with. This entry was posted on Saturday, July 30th, 2011 at 11:35 AM by A Guest Writer	and is filed under Free Crochet Patterns. You can follow any responses to this entry through the RSS 2.0 feed. You can leave a response, or trackback from your own site. Cool. This would look great in tan and chestnut. Very nice and creative Linda! It looks hot! (pun intended). It resembles the burners on the top of some stoves. Sarah Dee; that would look nice (hope you don’t mind if I borrow your idea). Delores Chamblin; LOL! Thank you, I hadn’t thought of that but now that you mention it I guess it does (we can pretend it was intentional). Color A is listed as color of choice twice, shouldn’t one be color B? Just asking. That rnd uses only one color so its A all the way around, the reason its on there twice is because you do an increase in every 3rd stitch. Looks real hot! Would look good in rust and brown too. Thanks for the answer, that cleared up my confusion. Cool pattern! The picture looks kind of familiar but I can’t place it, did you make it up?